I’m not a superstitious person and, for the most part, I don’t believe in signs and portents. However, occasionally things happen that I take as sort of a divine indicator saying “Hey, that thing you’re worrying about? It’s going to be okay.” There are three times that come to mind: the purchase of our second house, the time I was admitted to the hospital during my second pregnancy with a condition that could have easily caused a miscarriage, and the purchase of our new house. For the purpose of this post, I’m going to stick to the houses and save the pregnancy problems for another time. When our boys were 8 and 10 we decided it was time to move. Four people sharing a house that was less than one thousand square feet in size and which sported only one bathroom was getting a bit difficult. So, the search for a new domicile began. We knew we wanted a house in an older, established neighborhood with lots of mature trees. Our search eventually led us to two houses on the same street – and that’s where the difficulties began. 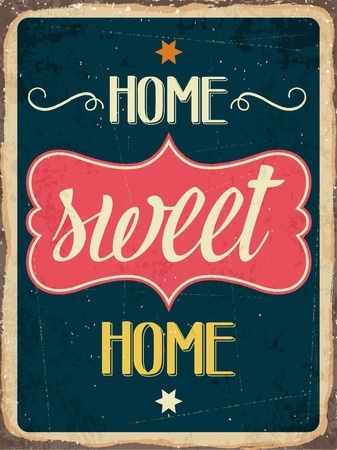 My husband preferred one house while I liked the other. We toured both houses, had many discussions – and a few arguments – to no avail. The stalemate continued. Finally, we met with the real estate agent to take one more tour of the house my husband wanted. I thought it was a complete waste of time. However, during the tour I did something I hadn’t done before – I opened the cabinet under the kitchen sink. My heart skipped a beat when I saw the pattern on the liner that had been used – it was different from the liner in any of the other cabinets in the house. The pattern on the liner under the sink was a cow print – white with black spots. Simply put, I adore cows; they are one of my favorite animals on the planet. As soon as I saw that print, I knew beyond the shadow of a doubt that even though that was not the house I wanted, it would be okay. And you know what? It was. We lived in that house for twenty years and honestly, it worked better for us than the other house would have. Once our boys left home and we no longer had the responsibility of caring for my aging parents we could get serious about moving back to the country. My husband and I both grew up in a rural environment and we missed being surrounded by nature. Earlier this year on his way home from visiting his mom, my husband came across a house for sale that he thought might interest us. While that house wasn’t the right one for us, it did begin the house hunting process. We even made an offer on a house only to withdraw it. The more houses we looked at, the more I doubted that we would ever find something that appealed to us both. Then, I fell in love with a house that my husband wasn’t crazy about. He finally agreed to go look at the house one more time but, on the way, we drove through a neighborhood that we had driven through months earlier and encountered another house for sale. The new house hadn’t shown up on my searches because the price was higher than the limit I had set. That price difference was enough to make me hesitate about seeing it but, since my hubby was willing to go back to the house I loved, the least I could do was see the house he wanted to see. Wouldn’t you know it? The house I loved, which had been on the market for several months with no activity suddenly had not one but several offers on it – none of which were ours. My heart was aching a bit as we met the real estate agent to tour the house hubby wanted to see. Then, we went inside. I loved the house and everything about it. It had a very cabin/rustic vibe which is right down my alley. The house is situated on just over four acres of land and even though there are other houses nearby, they aren’t on top of each other – there is space to breathe. We spent two and a half hours walking the grounds and touring the house and, before we left, we put in an offer. The rest, as they say, is history. We moved in at the beginning of August. That said, there were times I questioned our decision. Were we nuts to be spending so much on a house? Had we made the right choice? Should we back out? In spite of loving the house, I couldn’t seem to stop the nagging doubts. And then, I got my sign. A couple of weeks after we moved my husband asked me if I had seen the back of the door in the basement bathroom. The back of the door? No, I had not. I had looked behind the door to make sure there were no holes in the wall or anything like that but I hadn’t actually looked at the back of the door itself. To be honest, his question made me a little uneasy. The last thing I wanted was to find something that needed to be repaired or replaced. Hubby assured me that it wasn’t anything bad so I headed downstairs. Not knowing what to expect, I stepped into the bathroom, turned on the light, closed the door, looked at the back, and burst into tears. This is what is on the back of the door. 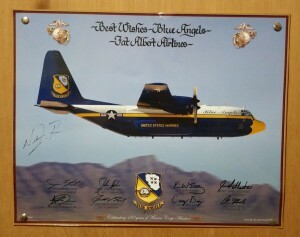 Why would a signed poster of the Blue Angels support plane (Fat Albert) make me cry? Well, my daddy (who passed away in February 2016) was a Navy guy. His time in the Navy is one of the things he was most proud of in his life and he was a huge fan of the Blue Angels. He also had a picture of the Blue Angels, signed by all of the pilots, which was one of his most prized possessions. 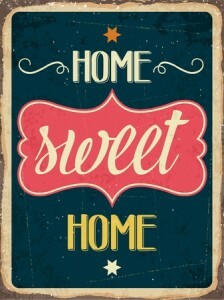 So, to find this in my new house… Well, this is my sign that, once again, everything will be okay. Since finding it, my doubts have gone away. This is where we are supposed to be and, if he were alive to see it, my daddy would love this place. How about you? What signs have you had in your life? I’d love to hear about them! This entry was posted in Life and tagged Blue Angels, cow print, cows, differences in opinion, here's your sign, house buying, it will be okay, Navy, portents, signs, superstition. ← Faith in Humanity Restored? From time to time, I have dreams, very real dreams. They’re usually about mundane life. Nothing spectacular, just a snippet of day to day life. At some point in the future, I’ll live that part of the dream, and know that I’m exactly where I’m supposed to be. In every instance that comes to mind right now, those déjà vu moments have come when I’ve been questioning if I’m on the right path. Life then might not always be where I think that I’d like for it to be, but I’m always reassured that I’m where it’s supposed to be.